If you are looking for information on the Jugo Juice franchise business opportunity, Jugo Juice smoothie franchises or Jugo Juice franchising, then you have come to the right place. In the summer of 1995, our founders, Derek Brock and Jason Cunningham, were working as managers with a beverage company that was really starting to take off (Starbucks--you may have heard of it). They were very excited about how consumers responded so enthusiastically (to say the least!) to the idea of premium take on an "old" product--coffee. They wanted to repeat that success in their own business. With the coffee space already crowded, they brain-stormed what would be the next beverage to capture the public's imagination. Smoothies were gaining popularity at that time but no one was offering a truly premium product and brand experience. Why shouldn't your coffee break be your best meal of the day? We thought people would prefer a healthy and delicious alternative. For the price and time it takes to have a fancy coffee drink, people can have a healthy "meal in a cup." A healthy idea that's also a great business idea. 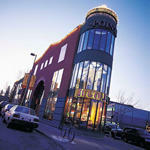 We opened our first Jugo Juice location in December 1998 in Calgary's [Canada] Eau Claire Market. Since franchising its business in 2002, Jugo Juice has grown to a flourishing chain of stores across North America. Jugo Juice is leading the way in today's world of fast food with the simple belief that natural unprocessed foods is what the future holds for healthy living.